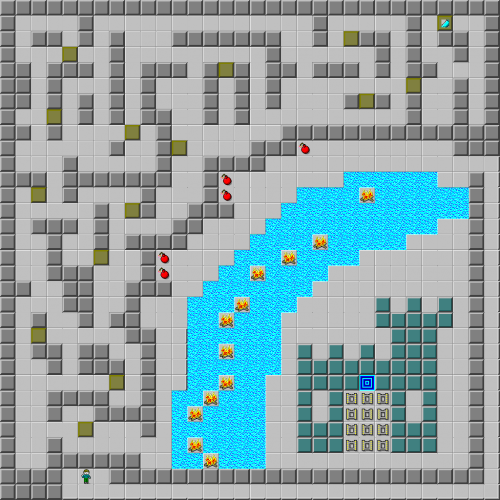 Castle Moat - The Chip's Challenge Wiki - The Chip's Challenge Database that anyone can edit! 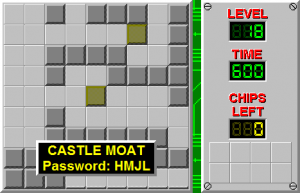 Castle Moat is the 18th level in Chip's Challenge 1. As it appears, Chip must move two blocks into two water spaces at (12, 19) and (12, 20), one at (16, 15) which allows continued moving of the blocks northeast, and finally two blocks on the far eastern edge of the moat at (28, 12) and (8, 13), in order to reach the exit; much quicker is the pair of flippers located under the block at (28, 1), which makes it easy to simply swim over the moat. Without a level editor, this solution is rather cryptic to find, because the flippers are in a location which doesn't free any blocks for use, and the route that does not use the flippers, known as the no boost route, won't enter this area using only five blocks. For this route, which has reached 434, see the second uploaded AVI. Castle Moat is the only CC1 level to contain chip sockets without containing any chips. This page was last edited on 13 March 2019, at 02:08.